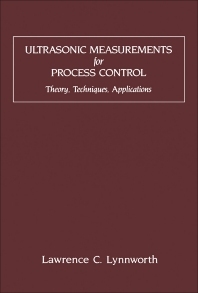 Engineers, scientists, and technologists will find here, for the first time, a clear and comprehensive account of applications of ultrasonics in the field of process control. Using numerous examples of high-volume, low-cost applications, the author illustrates how the use of new transducer materials and designs, combined with microprocessor-based electronics, make technical and financial sense for concepts that only a few years ago might have been of interest only to academicians. Some of the important topics covered include coupling, acoustic isolation, transducer and sensor design, and signal detection in the presence of noise. Industrial engineers, electronics engineers, mechanical engineers working or researching in the process industries. Introduction. Scope of Applications. Theory and Measurement Techniques. Flow Applications. Temperature Applications. Density Applications. Interface Measurement, Proximity Sensing, and Gaging Applications. Elastic Moduli Applications. Other Parameters--Special Topics. Historical Notes and Anecdotes. References. Index.